The Home Appliance Segment is a multi-billion-dollar industry. It includes electrical and mechanical machines which accomplish some household functions, such as cooking, cleaning, cooling, heating, and many more. Home Appliance Industry can be divided into two categories: major appliances and small appliances. The first section comprises of big machines used at home, such as air conditioners, dish-washers, freezers, washing machines etc. The second section, as the name specifies, includes small electronic machines which can be easily carried, such as heaters, irons, toasters, camcorders, telephones etc. The segregation of home appliances is also recognizable in the maintenance and repair of these products. Major appliances require practical skills to operate the machines and tools used to repair them, whereas, the smaller ones, although small, require high technical knowledge and skills, which get complex with time. Home appliances do require thorough quality check in terms of performance, standard, and reliability. Designs of these products also matter for the end users. Noble Precision takes complete pride in its capabilities to provide the best solutions for the very complex needs of the manufacturing units of Home Appliance Industry. Keeping up with the market and technical advancement is a must in the fast growing era. Noble Precision, being up-to-date, results in producing the best products for all manufacturing units. To ensure complete client satisfaction with high quality products, Noble Precision’s team includes domain experts, 5-axis simultaneous CNC Machines and the latest in CAD/CAM software technology. We accelerate innovation with our product designing software that enables rapid and accurate modelling of complex home appliance products. Earlier known as a time-consuming and exorbitant procedure, gun drilling is now technically advanced and very efficacious manufacturing process used in all metal cutting industries, including home appliance industry. For deep hole and high precision drilling projects, gun drilling is a perfect solution. At Noble Precision, the latest CAD/CAM software technology and 5-axis simultaneous CNC machines give a flawless surface appearance to the holes with exact specifications. These machines are especially designed to provide optimum conditions for such tasks, providing the deepest depth-diameter ratios and the highest accuracy rate. Accuracy in molds is very important for any manufacturing unit. Quality should also assure reusability. Noble Precision is equipped with all the necessary facilities to provide customized quality molds for the home appliance industry. 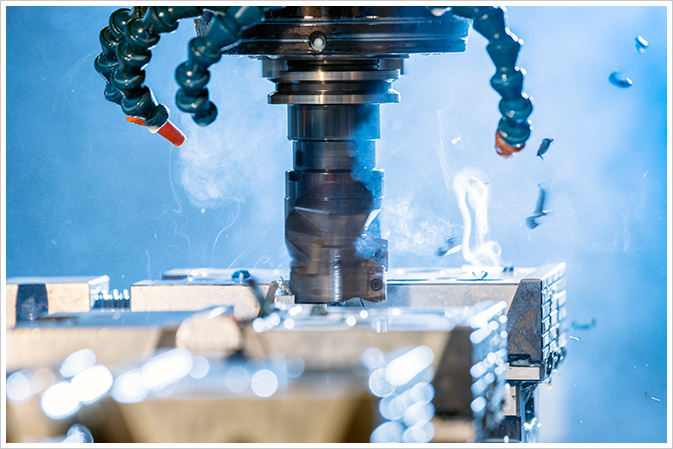 We understand client’s requirements and provide them with the best possible solutions using the latest CAD/CAM technology and 5-axis simultaneous CNC machines. The home appliance manufacturing units which require wide range of molds can completely depend on the comprehensive capabilities of Noble Precision. Our zeal to provide the best is proved in the impeccability of our products and services. Mold designing, making, sampling, and evaluation are Noble Precision’s specialized areas which also include production support & maintenance. The process of assembling parts and components may sound very simple, but in actual terms it is very complicated. The parts or components of different kinds of metals used in the household appliances are placed together by assembling them, which are then fixed with welding. Few examples of assembling in the home appliance industry are products that hold big amounts of injection-molded plastic parts, such as coffee-makers, humidifiers, and vacuum-cleaners. Dryer drums, retaining gears for washing machines, stainless steel brackets used in electric and gas ranges, inner linings of metal frames, and refrigerator shelves are also assembled. Noble Precision’s advanced technology and domain expert team is capable to create robust designs with perfect outlines, more importantly enhancing the strength and durability of the products. Appliance manufacturing units for sure look for a more dependable name and we are proud to be one. Noble Precision has been designing and manufacturing automated assembling lines for Home Appliance Industry with complete client satisfaction. Modern fabrication and welding techniques are applied in the manufacturing of various products in the home appliance industry. Layout – The process of drawing lines on the raw material based on the specifications provided. Cutout – The process of removing all the unwanted materials around the laid-out part or just cutting the material to the required specifications. Assembling – The process of putting all the parts together in the accurate position and orientation with each other. Welding – The process of attaching the parts together to form the finished component. Finishing – This process is fulfilled by any number of various processes such as grinding, polishing, drilling, machining, painting, etc. The involvement, difficulty level, and order of the steps depend on the material and complexity of the fabrication. Noble Precision designs and manufactures fixtures for Home Appliance Industry based on their specifications. Advanced technology and machines with domain experts used at Noble Precision is accentuated in the final produced components. With the ability to design effective fixtures, Noble Precision also assures complete patience and customer support for all your specifications and industry based requirements. Perfection is in our virtue. We do not have place for “good enough”. Noble Precision’s 5-axis simultaneous CNC machines, the latest CAD/CAM software technology, and the most dedicated and expert team provide complete support in fulfilling our commitments and client satisfaction. Stamping Die is a tool which includes an engraved die used to cut and stamp a metal sheet. 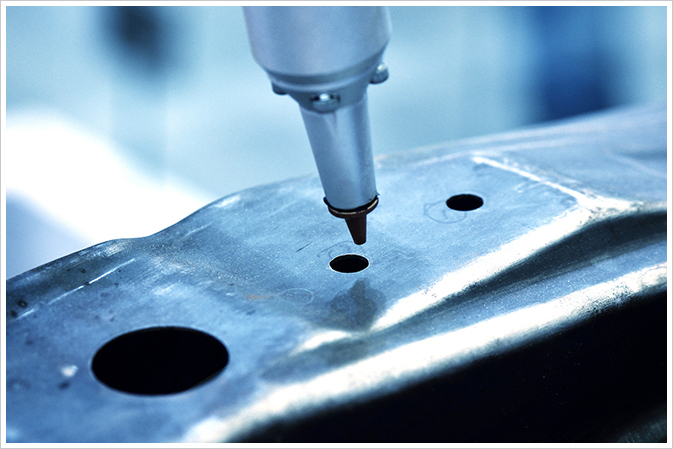 This cutting and forming of metal parts is a very important process. The end product is completely dependent on the exactness of these parts. To ensure highest level of efficiency for both simple and complex metal stamping projects, Noble Precision uses the most advanced technology and 5-axis simultaneous CNC machines. Our domain expertise provides added advantage throughout the process. Noble Precision is known to meet the complex demands and challenges affiliated with the manufacturing of home appliances. Quality, accuracy, and customer service always top our priority list. Noble Precision meets market demands and appliance manufacturing units’ requirements with innovative technology and expert professionals. We provide complete customized solutions for all the needs of home appliance industry. Commitment and dedication, result in quality products and services keeping us well placed in the market. Understanding the changing needs of the clients and technical advancements in the industry always keep us focused to deliver nothing but the best. For Home Appliance manufacturing units, Noble Precision brings a complete range of products and services under one roof. Our customized and high quality deliverables ensure reliability, enhanced performance, and quality besides being cost effective. To further discuss your benefits and our capabilities of using advanced technology and domain knowledge, call Noble Precision at 416-938-6455 or contact us to book a convenient time for a complimentary consultation.